Fiber Broadband Association : What is Fiber Broadband? Connecting homes, business and any endpoints -- including cellular towers or sites -- directly to fiber optic cable enables enormous improvements in what bandwidth devices are capable of delivering. Current fiber optic technology can provide two-way transmission speeds – upload and download -- of over a gigabit per second. And as older technologies stretch the limits of their performance or speed, constant improvements in fiber optic technology and equipment can improve how much bandwidth is available without having to deploy a new networks. That’s why fiber networks are said to be “futureproof." Click here for the Broadband Communities Fiber Primer . 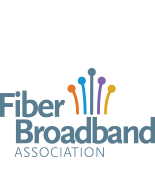 Click here to see the Fiber Broadband Associations Fiber Guide .